Most of us are in conflict with the law. However, the judges are not trained people, but nature and consequences. What am I talking about? 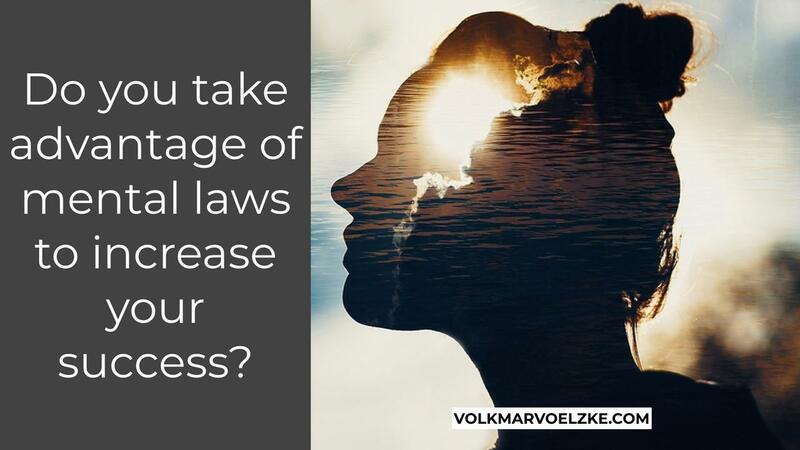 Well, besides human-made laws, there are natural laws and mental laws. The mental laws are just as 100% valid as the laws of nature. As an example, no matter whether you like gravity, know something about it or not: the law of gravity works at 100 percent. That's why we adhere to it. However, many people are careless with mental laws and think they can outsmart them. The result is dissatisfaction, failure, lack of fulfillment and much more. Law of correspondence. Your outer world is always a reflection of your inner world. What you think internally and what you believe in will manifest itself around you, whether you want it or not. Therefore, always start changes in your head. Law of cause and effect. This is also a law of nature. The mental form says that your beliefs are the cause and actions are the result. You will do and decide what you believe in. Remarkably, many hardly know of their beliefs. Law of attraction. You are like a magnet. You will attract what you send out as signals. If you radiate that you succeed, you will also be more successful. If you believe that you cannot trust people, you will experience exactly that. And vice versa. The essence: You have it in your hand to make use of these mental laws - or to work against them. Just like every member of your team.